Congressman William L. “Bill” Hungate (D-MO-9) founded Honeyshuck with wife Dottie in 1973. Together with community leaders, the Bowling Green natives purchased the property and ultimately transferred it to the non-profit corporation, Champ Clark Honey Shuck Restoration, Inc.
Bill was a scholar, musician, soldier, lawyer, songwriter, humorist, legislator, statesman and judge. In private life, he was a devoted husband, father and grandfather. Born in Benton, Illinois in 1922, he came from humble beginnings—his father was a salesman and his mother a school teacher. When his Dad lost his job in the depression they lost their home. Finding another job with northeast Missouri as his territory, he moved the family to Bowling Green, Missouri in 1929. Bill showed an early aptitude for music, playing piano, accordion, clarinet and saxophone. While in High School he played with local dance bands. 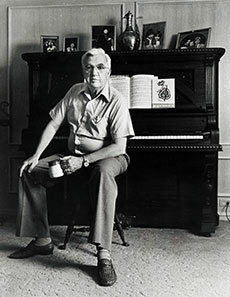 His musical ability stood him in good stead, enabling him to pay his way through college at Central Methodist and Missouri University graduating in 1943. He served in the infantry in Europe in World War II, earning the combat infantry badge, Bronze Star, and the Metz Medal. He led his regiment’s dance band, entertaining the troops at the front. His 12 man rifle squad suffered 5 killed and 5 wounded. He felt he owed a tremendous debt to those friends who didn’t survive the war who, as he put it, “made his children’s laughter possible,” and chose a life of public service in hopes of repaying that debt. He attended Harvard Law School on the G.I. Bill, graduating in 1948 and beginning his law practice in Troy, Mo. later that year. He served as Prosecuting Attorney of Lincoln County, Missouri from 1950 to 1956. From 1958-1964 he served as special assistant attorney general of Missouri. In 1964, Bill ran for Congress and was elected after defeating 15 other candidates in the Democratic Primary. In Congress he participated in writing the Federal Rules of Evidence, and served prominently on the House Judiciary Committee during the impeachment of Richard Nixon. His wisdom, often expressed through humor, contributed importantly to the proceedings. He gained some renown for a song he wrote at the time, “Down at the Old Watergate.” Listen on YouTube here. Bill retired from Congress in 1976, practiced law and taught at the University of Missouri in St. Louis. In 1979, Bill was appointed to the Federal Judiciary by President Carter. His first major task as a judge was to desegregate the St. Louis Public schools, which he accomplished in the face of vicious opposition. He received the Elijah Lovejoy award for his contribution to Civil Rights through his desegregation plan. After his retirement from the Federal Bench in 1992, he devoted his time to writing, public speaking engagements, which usually included performances of his songs, and to Grandparenting. He passed away in 2007 at the age of 84. Bill Hungate possessed the essence of what we call “character,”and was something of a character whose humor could deliver wisdom when the occasion demanded. It took something of a character to found “Bedford University,” a “liberally unaccredited” institution for which he, the “Last Clear Chancellor,” wrote several school songs, and held annual commence ceremonies where he awarded honorary degrees to his friends. He accumulated a vast treasure on earth, not of money but of friends. He kept childhood friends throughout his life and added to the collection along the way in the army, in college, in dance bands, practicing law, running for congress and as a judge. He loved more than anything to be able to make his friends laugh, and he maintained a long record of success at this. Without doubt the best friend by far was his wife Dottie. She laughed at his jokes, tolerated his impatience, encouraged him and stood by him all his adult life. He would have been less and would have done less, without her. He loved Southern Illinois, where he was born, and Pike County, where his family moved when he was 9, and Troy where he began his career and raised his family. 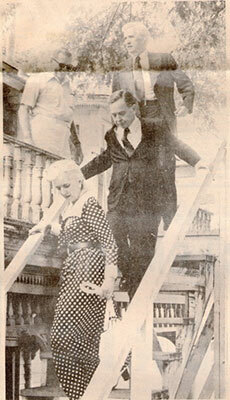 Inspecting Honeyshuck, Champ Clark's Bowling Green home, purchased by Congressman Bill Hungate for restoration as a memorial to Clark are from bottom to top: Mrs. Hungate, Speaker of the House Carl Albert, Congressman Hungate and Bill Crow of Farber, a member of the Honeyshuck Restoration Board.